Submitted by Taps Coogan on the 24th of March 2018 to The Sounding Line. As we have discussed on numerous occasions here at The Sounding Line, the rapid increase in opioid overdoses from drugs like heroin and fentanyl is one of the most pressing public health emergencies to strike the US. 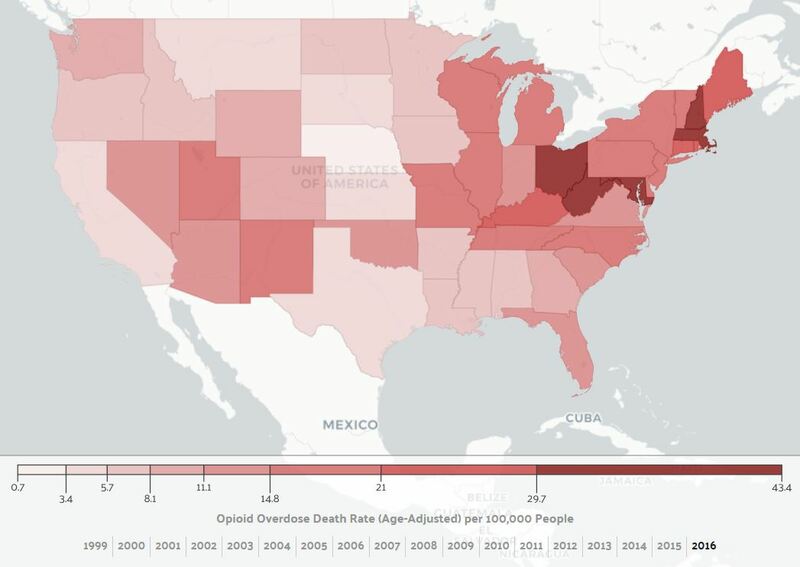 The following interactive map, via DataUSA.io, shows the fatal opioid drug overdose rate in every state in the US. By changing the year at the bottom of the map it is possible to see how rates have increased across the country in the past few years. As the map reveals, some of the most affected states are West Virginia, New Hampshire, Ohio, Massachusetts, and Maine. To put the magnitude of the opioid crisis in perspective, it is estimated that 64,070 Americans died of drug overdoses in 2016. That is more than the number who died in car crashes (35,092), more than were killed by AIDS at its worst in 1995 (50,628), more than homicides at their peak in 1991 (24,703), and more than all Americans killed in the entire Vietnam War (58,200). Since 2016, the problem has only gotten worse and drug overdoses have now become the leading cause of death for Americans under 50. The opioid crisis, combined with rising rates of obesity, have become so severe that the average life expectancy in the US has fallen for two consecutive years for the first time since the 1960s. Ohio = hopelessness at having all the manufacturing jobs sent to China. West Virginia = hopelessness at having the coal industry sacrificed on the alter of the global warming hoax. But New Hampshire and Massachusetts? I thought they were liberal socialist paradises. And Nebraska, the lowest… they won’t even let you buy non-psychoactive cannabidiol oil there. Not sure you can find a correlation to liberal or conservative or economic success. California is low and is very liberal and expensive, Utah is reasonably high for the region and they are the most true conservative in the region and they are both reasonably prosperous as far as jobs are concerned. More of a hopelessness issue, I should think. Having to watch while the country is plundered by oligarchs and sold to the Chinese for 30 pieces of silver.